Paint Protection at it’s Best! Welcome to Body-Skins Inc., your source for clear bra technology. 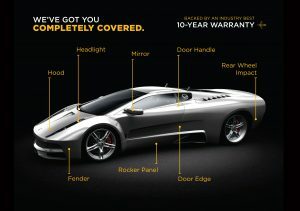 We are a full service Paint Protection Film distributor and installer in the Chicagoland market. We offer precision computer cut kits that take the place of those unsightly bug shields and conventional leather or vinyl car bras. Our office is centrally located in the suburbs of Chicago Illinois. We are factory trained and certified professionals. 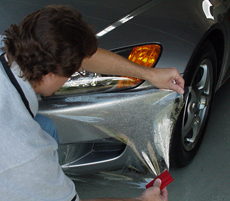 We are also backed by the leaders in the Paint Protection Film industry and offer superior one-piece designed kits. 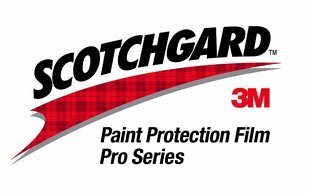 Body-Skins Inc., a leading Chicagoland company, distributes and installs the 3M and Xpel brand of Paint Protection Film. Our film is OEM and Nascar approved. 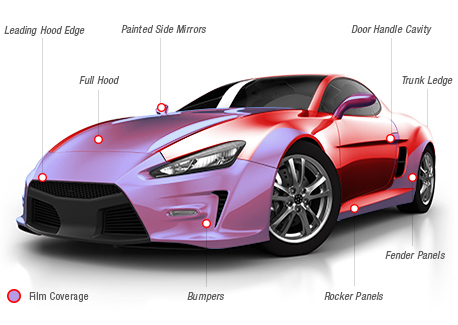 Whether you drive a car, motorhome, or anything in between, Body-Skins has the kit for you. Rock and stone chips, bug acids, ice, and sand abrasion are no longer a nuisance when protected with a Body-Skin. 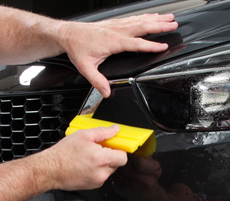 Have this virtually invisible urethane film professionally applied to high-impact areas of your vehicle to protect your paint job from stone chips, sand, road debris and bug acids. Constructed of tough, conformable thermoplastic urethane, covered by a clear coat layer. Can be applied on painted surfaces, plastic surfaces and bumpers in automotive and marine applications.